The dramatic change in fortune for the equity markets was coincident with, and driven by, an equally dramatic pivot in monetary policy by the Federal Reserve Board. In a startling shift, the Fed reduced the number of projected rate hikes in 2019 from two to zero and called for an end to quantitative tightening by this September. The new dovish position contributed meaningfully to the recovery in stock prices. However, investors still harbor lingering doubts about the future direction of the economy. With the current expansion poised to become the longest ever, the timing of the next recession remains a topic of intense debate. Investors focused on this issue even more after a notable bond market development in late March. For the first time since 2006, the yield curve, as measured by the difference in 10-year bond and 3-month T-bill rates, became inverted. This inversion of the yield curve, where long rates fall below short rates, is an important marker because it has previously been a reliable indicator of a recession. The 10-year bond yield is widely acknowledged to be a gauge of future expected growth. Short rates, such as the 3-month and 2-year yields, usually reflect Fed policy as it balances its dual mandate of managing growth and inflation. Inverted yield curves are seen as a precursor to recessions, which generally unfold in the manner described below. The Fed inevitably raises short rates towards the end of the cycle to combat rising inflation in an overheated economy. Higher rates eventually choke off economic activity, which causes long rates to decline. The combination of high short rates and low long rates also curbs bank lending, which in turn further slows the economy down. 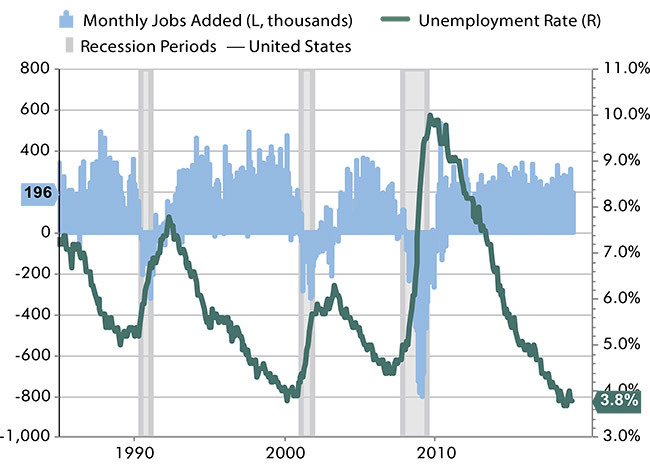 Recessions have typically ensued within 12 to 24 months of an inverted curve. The signals from the stock and bond markets appear to be at odds with one another on the possibility of a recession. The bond market seems to assign a higher probability to the outcome by recently pricing in a negative spread between 10-year and 3-month interest rates. However, stocks have continued to rally in the face of an inverted yield curve which is incongruent with an imminent, or even impending, recession. Is the bond market too pessimistic? Is the stock market overly optimistic? We examine recent market developments to form a view on the health of the U.S. economy. We believe that the conspicuous absence of inflationary pressures differentiates this inversion of the yield curve from prior instances. Figure 1 traces its evolution during the first quarter. As we can see above, short term rates remained anchored to the Fed Funds rate and held steady just above 2.4% during the first quarter. Long term rates, however, fell in March after the unexpected Fed announcement. This inversion was caused by a decline in long rates on the heels of muted inflation, a dovish shift by the Fed and signs of a cooling economy. This is in sharp contrast to previous inversions, which have been caused by a rise in short rates. Previous cycles have usually come to an end when inflation rises in an overheated economy. Against such a backdrop, the Fed has no choice but to combat inflation by signaling continued tightening. This causes short rates to continue higher until they exceed long rates and invert the yield curve. We do not see these dynamics at play in the current inversion. Inflation is lower than target, not higher and the Fed is more dovish, not hawkish. At a more nuanced level, historical inversions have typically been observed first with the 2-year rate and only later on with the 3-month rate. The Fed’s intentions to tighten get priced in through a rise in the 2-year rate. The Fed’s subsequent actions when they implement the signaled rate hikes eventually cause the 3-month rate to go higher. History reveals that the 10y-2y spread inverts before the 10y-3m spread. We have not seen this happen in the current inversion. Figure 2 highlights the contrast between the March 2019 inversion and previous inversions. The chart shows that the 10y-3m spread turned negative in late March, but the 10y-2y differential did not. The table in the inset highlights how the 10y-2y has inverted before the 10y-3m in all seven instances prior to the current inversion. We believe that both the decline in long rates and the positive spread in the 10y-2y curve make this inversion different. We don’t see rising inflation and a hawkish Fed as risks to future growth. We, therefore, believe that the recessionary signal from the brief March 2019 inversion of the 10y-3m yield curve is weak, and assign a low probability to a recession in the next twelve months. We present more affirmative arguments for an extension of this economic cycle in the next section. There is clear evidence that the U.S. economy has slowed down. We are unlikely to see growth as high as 4.2% in a single quarter like we did in 2018 Q2. Annual growth rates are also likely to be lower than the 2.9% seen in 2018. While most gauges of economic activity confirm the slowdown, they remain well above levels that normally precede a recession. We believe growth is reverting back to the trend level of around 2%, but no worse. The U.S. economy is driven in large part by the U.S. consumer and the U.S. consumer appears healthy. A lot was made of the surprisingly weak jobs number in February, which was initially reported at 20,000 and subsequently revised to 33,000. But the rebound in nonfarm payrolls for March back to 196,000 still portrays a solid job market as shown in Figure 3. Jobs have grown by an average of about 180,000 in the first 3 months of 2019. The weakness in February may at least partially be explained by the unusually cold weather across the country and the lingering after- effects of the government shutdown. Consistent with the slowdown, average job growth of 180,000 in 2019 is below the 225,000 average in 2018. It is, nonetheless, well ahead of pre-recession levels when job growth drops below 100,000 and trends lower. Additionally, unemployment remains low at 3.8% and jobless claims are close to historical lows. Not surprisingly, the solid job market has also improved consumer income statements and balance sheets as seen in Figure 4. Nominal wage growth has picked up from around 2.5% to well above 3% in the last several months. 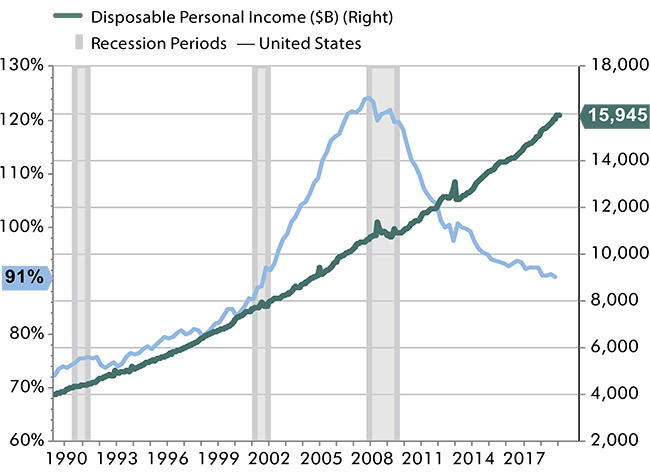 Disposable personal income has risen steadily as a result. These gains outstrip modest inflation levels resulting in a rise in real wages and income. As the U.S. consumer continues to deleverage, household debt continues to decline as a percentage of disposable income. This is in stark contrast to the trend seen prior to the Great Recession in 2008 when debt skyrocketed as a percentage of income. We do not see signs of excess with the consumer that have historically presaged a recession. We believe the strength of the U.S. consumer will prolong this economic cycle in the foreseeable future. 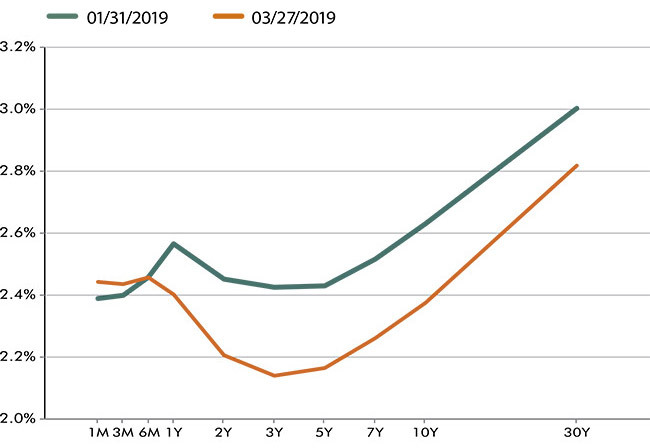 The yield curve inverted with a negative 10y-3m spread in late March. The inversion lasted for a few days before reversing itself. We believe that this inversion of the yield curve was different from prior instances. In the most recent instance, the yield curve inverted from a decline in long rates, not a rise in short rates. Long rates fell because inflation is tame, the Fed is dovish and growth is normalizing at trend levels. As a result, we do not believe that the latest inversion carries the same recessionary signal that it historically has. Our belief is further bolstered by the strength of the U.S. consumer. A solid job market, low unemployment, rising incomes and stronger consumer balance sheets are likely to extend this expansion beyond most expectations. We maintain our overweight to equities and cyclical sectors within well-diversified portfolios. We continue to focus on companies with strong fundamentals in both the public and private markets.